Yahoo on Thursday unveiled an updated Yahoo News page as part of the broader ongoing effort to revitalize the Web portal under CEO Marissa Mayer. 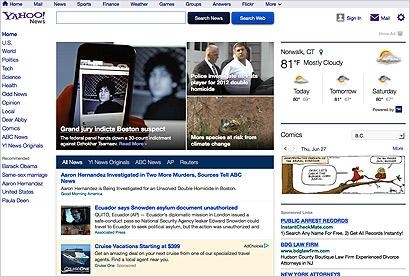 The new look for Yahoo News follows the redesign of the Yahoo home page earlier this year and incorporates one of its main features: the infinite-scrolling news feed. Like the home page feed, the one in Yahoo News becomes more tailored to logged-in users’ interests over time, based on what they read and view. It also includes the native Stream Ad format the company launched in April, with sponsored posts appearing in a slightly darker shade and displaying the AdChoices logo in the right corner. The Yahoo News facelift also extends to mobile, with the new version already live on iOS devices and coming soon to Android ones. The site redesign will roll out fully for U.S. users over the next couple of days. As part of her turnaround efforts at Yahoo, Mayer has focused on revamping about a dozen of its core properties, including the home page, Yahoo Mail, Yahoo News and Yahoo Finance. The Yahoo News page overall gets a cleaner, more streamlined design with a navigation bar to the left of the feed. It lists different subject areas including politics, tech and science, as well as a link to content from Yahoo content partner ABC News. The ad placements on Thursday showed a billboard pushdown unit and a standard 300 x 250 banner on the right side below the fold. Both ads promoted HP’s Discover 2013 conference. At the company’s shareholder meeting on Tuesday, Mayer indicated changes made so far were paying off, including a 50% gain in daily active users for the Flickr app since its overhaul in May, while email use has jumped 70% since an upgrade in April. During Yahoo’s first quarter conference call, she also noted that page views and time spent were up on the home page since its redesign in February. Even so, Yahoo had flat growth in the quarter as its display ad business fell 11%. The company attributed the decline in part to changes to Yahoo.com and Yahoo Mail that reduced the overall ad inventory. eMarketer has projected Yahoo’s share of display advertising will fall to 7.7% this year from 9%, falling further behind Facebook and Google. 1 comment about "Yahoo News Revamps Look, Updates Portal". Zachary Rischitelli from FiG Advertising and Marketing, June 27, 2013 at 4:56 p.m.